Day two of the shoot was much more sedate. Not a lot of night shooting and there was no running pell mell along an insanely steep slope. Unfortunately, heavy rains postponed a shot of Annalise throwing a green ribbon and burning a guy down to his bones. You can probably guess how much I’d have wanted to see that. Instead they got shots of Charles Hammer breathing fire, Ray’s iron gate spell activating, and Ray and Catherine fleeing from a bunch of Washaway pets. I got to play one of the Washaway pets. I feel like Alfred Hitchcock. :-) The only problem was that I was advancing with the other pets toward Ray Lilly, and when he pulled back and threw the ghost knife at us, I busted out a huge grin. Couldn’t help it. I don’t think it mattered because the shot wasn’t the keeper the director was looking for, but I had to remind myself to have fun on the inside only. Inside only! I’m sorry I can’t stay for tomorrow’s shots, which will include some effects shots of characters going through windows and other fun. It’ll also be the first call for actors playing characters from Circle of Enemies who I would have loved to meet and get pictures taken with. The characters’ names won’t mean anything to you guys because the book isn’t scheduled until next summer, but Wyrd has been doing such a great job that I wanted to see how they handled things. As for myself, I’m holding up pretty well, pain-wise. My left leg is pretty swollen, but the aching has gone way down. And as much as I wish I could hang out for the third day of the shoot, I miss my son and my wife. It’ll be good to see them again (and get back on a sensible schedule so I can get back to writing. Jesus, these film people never sleep). Hopefully, once I get back to my real life I can start responding to comments, answering email, the whole deal. 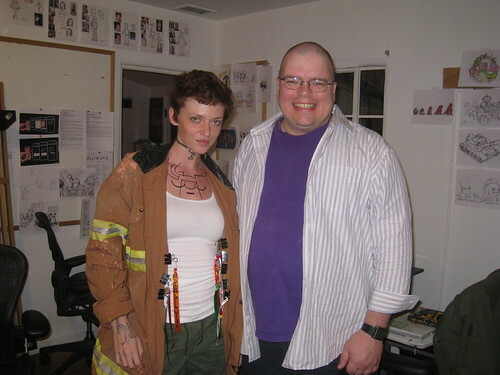 I’ll put the picture of me and “Annalise” behind a cut, but you can see more at the set. Fwah??? You mean you weren’t terrified by my scary body language and striped shirt? Merriam, at least, was scary! Looks like you had a good time at the shoot. I’m curious about the SFX shots and how that’ll turn out. Seems like special FX are what put SF&F stories out of the running in Hollywood so often. By the way, did you ever explain how the whole book trailer thing came about? I don’t remember reading anything about that on here, but maybe I just missed it. Greg, the book trailer happened because I sold foreign language rights and decided to hire some friends to do good work rather than spend it on something “practical” like a publicist (or a family car). I don’t expect to make back the cost of the trailer in book sales, but I don’t care. I’m going to come out of this with something absolutely awesome. Some of the FX are going to be greenscreen shots. Several will be cgi. I’m looking forward to seeing what they do with it, too. And I suspect that most writers don’t make trailers because, generally speaking, people think of them as a marketing tool, the way film trailers are. I don’t think they’re all that effective as marketing tools, but they can be cool in their own right.